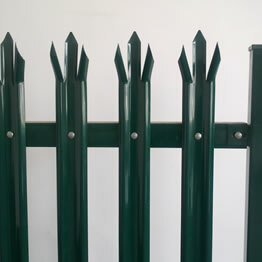 Plastic Coated Palisade Fence : Zhonghua Palisade Fencing Manufacture Co.
PVC coated palisase fencing has a strong and durable construction providing excellent protection, produced with either a 'D' or a 'W' profile to varying specifications. 1.2m, 1.5m, 1.8m, 2m, 2.1m, 2.4m and 3m heights are available. Can be single pointed, triple pointed, square tops or round & notched tops. Posts are formed from composite elements (square tubes and pales) for increased lateral strength and continued aesthetics. 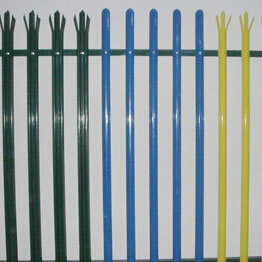 Bearers are welded or bolted to posts. All connecting holes are pre-punched to ensure maximum accuracy, ease of installation and to prevent rust.